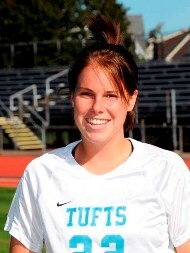 MEDFORD -- Two All-New England women's soccer teams were announced recently, and two Tufts University Jumbos were among those recognized. Junior midfielder Fanna Gamal (Albany, CA) was selected to the National Soccer Coaches Association of America (NSCAA) All-New England third team and to the New England Women's Intercollegiate Soccer Association third team. Sophomore defender Sarah Nolet (Los Altos, CA) is also on the NSCAA All-New England third team. In a season that started with promise, but was sidetracked by injuries, Gamal and Nolet provided the steady play that helped lead the Jumbo squad to a fourth-place finish in the conference. Coach Martha Whiting's team earned a home-field berth into the conference tournament and finished with an 8-5-1 overall record. Gamal's talents at midfield were critical to the team's offensive transition. With modest statistical totals of two goals and three assists for seven points in 14 games, her field vision and passing ability did not go unrecognized by region's coaches. 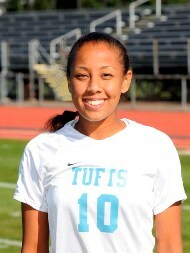 Gamal scored the eventual game-winning goal against Wesleyan on October 19. Of her three assists, two came in wins over Connecticut College and Wheaton. She was very active for the Jumbos with four shots in the NESCAC Tournament quarterfinal game against Bowdoin, which Tufts lost on penalty kicks. Nolet, whose 6-foot, athletic presence in the middle of the field alone made a difference for the Jumbos, was selected as a defender despite playing half of the season as a defensive center-midfielder. Her leadership and performance as a center-back stabilized Tufts defensively, as the team allowed only four goals in their last five games. She also contributed offensively with a team-high 30 shots attempted for the year, scoring three goals. She had the eventual game-winner in a big early-season, non-conference victory (2-0) at Wheaton. Nolet was also had three assists for the season. In the team's injury-plagued season, Nolet and Gamal were two of only five Jumbos to start all 14 games. Both players were also named to the All-New England Small College Athletic Conference first team.